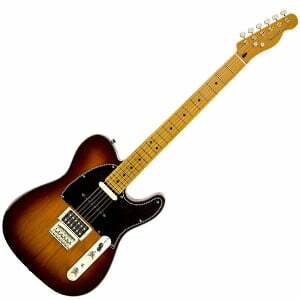 While the hardware in particular gives this model its contemporary feel, the overall design is classic Telecaster. It sports the timeless single-cutaway shape, with the body made from solid pine – a lesser-seen wood, but one which is actually pretty great for contributing warmth to the tone. This comes with a couple of finishes – Honey Burst or Charcoal Transparent – which both show off the attractive, tight grain of the pine. The playability of the Modern Player Tele is one of the reasons we recommend it as a great guitar for beginners. Bolted onto the body, the one-piece maple neck features a comfortable C shape with a gloss finish, maple fretboard and 22 jumbo frets, for easy string bending. The iconic Tele headstock completes the design nicely. To keep the costs low, this model is made in Fender’s Chinese factory, although the craftsmanship is very admirable – barely any flaws in the fit and finish. Onto the main event! Straying away from the tried-and-tested duo of single-coils, this Telecaster sports three pickups. At the neck you’ll find a traditional Telecaster single-coil, before the appearance of a Stratocaster single-coil in the middle. Just when you think it can’t get weirder, in comes a humbucker at the bridge. This unlikely trio proves a very versatile combo, as we discuss below. Adding to the versatility is a mini toggle to coil-split the humbucker, sandwiched between master volume and master tone knobs, as well as a five-way selector switch. The rest of the hardware is free from surprises. There’s a standard set of sealed chrome diecast tuners on the headstock, a vintage-style string-through-body fixed bridge with six saddles, and a synthetic bone nut – all contributing to good tuning stability and sustain. With the inclusion of three very different pickups – and coil-splitting for the humbucker – the tonal flexibility on this Tele is huge. In fact, there aren’t many tones you can’t find. Naturally, the Tele single-coil at the neck offers the more traditional twang you’d crave from a Telecaster (even if it is a little weak in terms of power). There’s more sparkle and bite in the middle Strat pickup, while the humbucker adds another dimension, giving you more dirt and beef for everything from classic rock to modern metal. The Modern Player Telecaster Plus certainly won’t appeal to everyone – especially Telecaster purists. But for such an affordable genuine Fender, the playability is great, it looks fantastic, and there’s a lot of tone and flexibility on offer. For more info about the Fender Modern Player Telecaster, click here.